Last Week in Review: It was a volatile week, from news both here at home and overseas. But how did home loan rates fare? Forecast for the Week: The Job Market will be front and center this week, with several important employment reports ahead. View: If you still have to file your taxes, or if you know anyone who still does, be sure to check out the tips below. To "QE" or not to "QE" - that is the question. And that pun on Shakespeare's famous quote is likely one that the Fed is weighing carefully these days, as they work to determine the best decisions for our economy. Read on to learn why...and what the impact could be on home loan rates. Last week, Personal Income and Spending came in close to expectations. While that is good news, one negative within this report that is something to consider is the inflation-adjusted income. 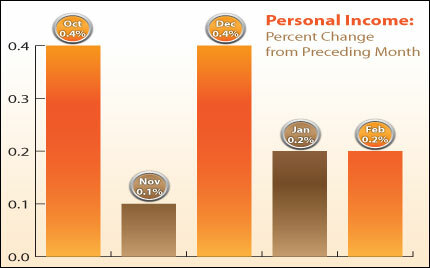 As you can see in the chart, Personal Income rose by 0.2%. But after factoring in the 0.3% rise in headline Personal Consumption Expenditures (which includes energy and food), income actually declined by 0.1%. We have seen incomes actually decline on an inflation adjusted basis three of the past four months. The rise in fuel prices is a big culprit for this negative trend and it highlights how high oil prices can be a detriment to the economy. In addition, the final reading of 4th Quarter Gross Domestic Product (GDP) for 2011 remained at 3.0%, a decent number. However, for 2011 overall, GDP was an anemic 1.625%, well below the number needed for a normal functioning economy. These factors -- combined with recent weak data from the housing sector and a discouraging bounce higher in last week's Initial Jobless Claims Report -- are all reasons that could make the Fed consider doing another round of Bond buying (Quantitative Easing or QE3). Remember: Home loan rates are tied to Mortgage Bonds...so as Bonds improve, home loan rates improve...and helping the housing market by keeping home loan rates low would be a big reason that the Fed would do another round of QE. Another key factor to keep in mind when it comes to whether Bonds and home loan rates will improve is the safe haven trade. The Eurodrama resurfaced front and center last week with the news from credit rating agency Standard and Poor's that Greece may have to restructure their debt again. Plus, there was news that Spain's GDP is already contracting, and the country is grappling with a 23% unemployment rate. All this to say -- there are many factors at play which could impact the direction that Bonds and home loan rates move in the coming weeks and months. The important thing to take away is that home loan rates still remain near historic lows and now continues to be a great time to purchase or refinance a home. Let me know if I can answer any questions at all for you or your clients. ISM Manufacturing Index will be released on Monday and gives the investor a broad look at manufacturing around the country. Wednesday's ADP Employment Change will be the precursor to the government report on Friday. Initial Weekly Jobless Claims will be released on Thursday. Jobless claims ticked up last week to 359,000 but the Labor Department said that the data includes the annual seasonal-adjustment revisions extending back five years, which led to the recent increases. The data that the entire investing community will be watching and waiting for is Friday's Employment Report, which includes Non-farm Payrolls and the Unemployment Report. For the past three months, employers have added 244,000 new workers on average and this pace will have to continue in order to get back to a more normal functioning economy. When you see these Bond prices moving higher, it means home loan rates are improving -- and when they are moving lower, home loan rates are getting worse. To go one step further -- a red "candle" means that MBS worsened during the day, while a green "candle" means MBS improved during the day. Depending on how dramatic the changes were on any given day, this can cause rate changes throughout the day, as well as on the rate sheets we start with each morning. As you can see in the chart below, Bonds and home loan rates benefitted from the drama in Europe and some weaker economic data last week. 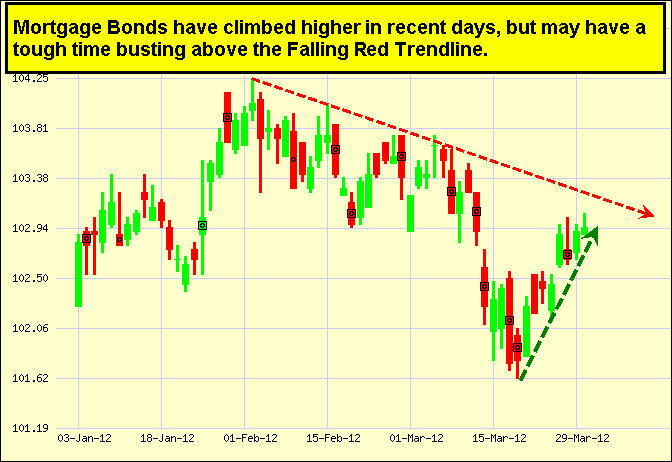 It's a volatile time in the markets and I'll be watching developments closely. 1. Two Extra Days to File! This year, April 15 falls on a weekend, so that pushes the deadline into the following week. But, that's not the end of the story. This year, Emancipation Day--which is a legal holiday in the District of Columbia--will be observed on Monday, April 16. And since the tax deadline cannot fall on a holiday, it means the due date for filing your tax return is extended to Tuesday, April 17, 2012. 2. Extension to Make IRA Contributions! In addition to the tax deadline being extended by two days, the deadline to contribute to your IRA is also extended to Tuesday, April 17, 2012. Along with this announcement, the IRS put together a list of 10 things you need to know about setting aside retirement money in an IRA. 3. Options for Paying Uncle Sam! If you're experiencing money troubles and you owe money on your taxes from last year, you may be eligible to receive a 6-month extension on your payment. And you may be surprised to learn about the details of this program! Read about the important qualifications and implications of the IRS announcement. Need even more news on taxes and the IRS? No problem! You can "Follow" the IRS on Twitter or "Like" the IRS on Facebook!